IT WAS so good to catch up with old friends Derek and Mary Triffett at Brighton with their D&M Triffett Heavy Haulage 2009 T-908 Kenworth with a 625 Cat up front and towing their triaxle Roadwest 30 tonne float. 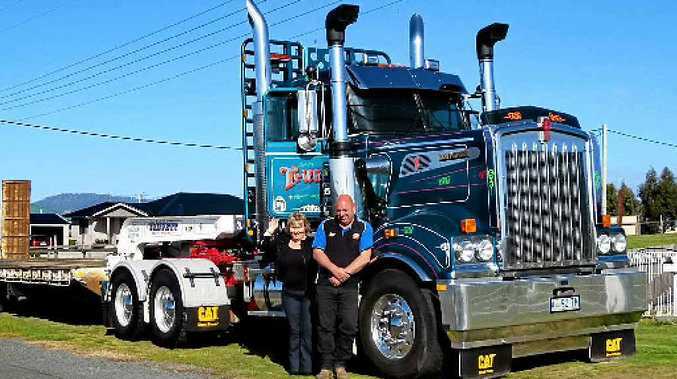 Derek was until recently a forest contractor in the Tasmanian forests but he and Mary decided to change business and are now operating their heavy haulage operation from Brighton, towing statewide, and even interstate, all things going well. They have an option on a larger float at present, and decided to keep the T-908 for their new operations having reluctantly parted with their Western Star and T-950 to M&M Excavations at Yarram in Victoria. They were sad indeed to see the old business go but are happy with the T-908, originally bought new from CJD Equipment. This dedicated husband and wife team, long time and highly professional road transport identities, are happy now that the change is all "done and dusted" and are looking forward to the future.